Step outside the greater Los Angeles area and visit three of Southern California’s most celebrated places! You’ll leave LA in the morning, heading north along the Pacific Coast to your first stop, Solvang, a quaint Danish town in the middle of the Santa Ynes Valley, featured prominently in the acclaimed movie Sideways. You’ll be delighted by Solvang's Danish architecture and the Little Mermaid statue, based on the tale by Hans Christian Andersen. This is a replica of the iconic statue in Copenhagen. Finally, browse the Danish bakeries and shops before returning to your coach. Next, you’ll drive to Hearst Castle. This unforgettable tour takes you through William Randolph Hearst’s notoriously opulent estate, famous as much for its guests as its décor. A favorite of the stars of Hollywood’s Golden Age, Hearst Castle is filled with art treasures and architecture from around the world – you’ll see Greek vases from 800 BC next to rare oriental carpets and magnificent statuary. Invitations to Hearst Castle were highly coveted in the 20s and 30s, so be sure to take pictures of the castle and its riches to prove you were there. From there, your road trip travels to Santa Barbara. Here, you’ll tour Old Mission Santa Barbara, the Spanish Mission that gives the town its name, and learn how these Spanish religious centers were essential to settling the entire state of California. You’ll see the Santa Barbara harbor and have the opportunity to take photos of the beautiful beaches before continuing on your tour. 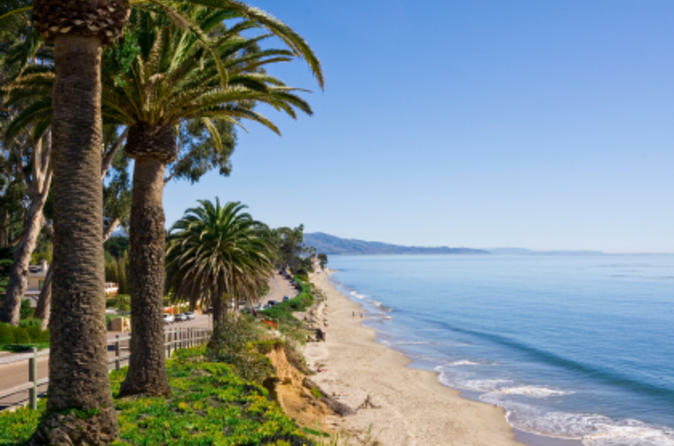 Following your time in Santa Barbara, you’ll board the coach for the scenic drive back to Los Angeles. It will be the perfect relaxing end to your full-day trip along the California coast.